Neal Stephenson is one of those authors who has my automatic loyalty: whatever he publishes, I’ll read (or at least try heroically, with regard to Anathem). But his last couple of books have been hit-or-miss for me, and I was a little nervous about what techno-doorstop might come next… until I realized it was about an apocalypse! Yes, Seveneves is a fully respectable and literary outlet for my end-of-the-world obsession. And if you can look past some pretty unlikely scenarios, it’s an impressively large-scale vision of the future, including some thought-provoking ethical questions on genetic modification and human nature. In the near future (essentially the present day), a meteor strike blasts the moon into pieces, which pulls the pin on a very large hand grenade: in about two years, the blown-up moon’s weakened gravity will cease to keep its fragments together in orbit, and all those pieces will fall onto Earth, boiling the oceans and burning the land and basically making the planet uninhabitable for 5,000 years or so. So humanity has about 24 months to throw the entire planet’s resources at the best possible scheme for preserving the species. What they come up with is the Cloud Ark: a low-orbit space colony, clustered around the existing International Space Station, that will be entrusted with a DNA bank diverse enough to reconstruct the human population when it’s feasible to do so. A small number of people, hand-picked by international lottery for genetic diversity as well as left-brain STEM talents, are also trained in all kinds of space tasks in preparation to become the seed population for the colony during its millennia in space. Or that’s how it’s supposed to go, anyway. In fact, a cascade of disasters, betrayals, and sheer bad luck demolish the human race down to just seven fertile women — the “seven Eves” of the title. Watching the inexorable destruction of Earth’s population is a nail-biting space thriller that goes for the first two-thirds of the book. It’s no spoiler to say that the last third is set 5,000 years in the future, where — despite everything we’ve seen so far — humanity has managed to cling on, and even thrive, in orbit around Old Earth. However, survival has come at the price of change, biologically and socially. The planet has finally recovered enough that humans can begin exploring the surface… but what they find there will change everything they thought they understood about their history. I know it sounds like I’ve just told you the entire plot, but trust me, I haven’t. I didn’t even give away any secrets! Like many of Stephenson’s novels, this is a nearly 900-page whopper, and much more happens than I could possibly reveal here. Seveneves explores the definition of humanity by poking at thorny issues like embryonic manipulation and selective breeding, and ponders what our species could be like — for better and for worse — if we were presented with the opportunity to literally rebuild our world. How radically would our descendants have to change before we couldn’t, or wouldn’t want to, accept them as “us”? Are there qualities inherent in our species that we can never outrun? 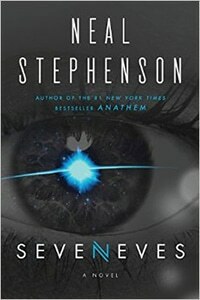 If you’ve tried Stephenson’s books before and didn’t like them, you might find Seveneves to be an improvement. The archly witty, wordplay-filled narrative voice that dominates his other books, almost becoming a character in its own right, is mostly absent. Sure, he’s still prone to long, meandering scientific digressions and mini-lessons, but that’s all part of the charm. This reads much more like straight-up, serious hard sci-fi (partly, as Stephenson explains in the afterword, as an homage to the beloved sci-fi pulp novels of his childhood). Strong female characters drive the action here, while male courage and strength tends to manifest as altruistic sacrifice to preserve the species by protecting the women. It’s a world of hacker heroes and strong, brilliant women, and I wouldn’t mind living in it… except for the part where the planet gets destroyed. A boldly imaginative, fast-paced adventure with the highest stakes possible, Seveneves is so exciting you’ll forget you’re learning physics. Recommended for apocalypse lovers, space nerds, and sci-fi fans alike.